A few weeks ago I mentioned my Grandma O’Donnell’s Ovenex bake ware she gave me years ago. Here is the mini loaf pan to the larger one-not as well seasoned as the bigger loaf pan, but used for extra quick bread dough, small meatloaves, and extra stuffing. 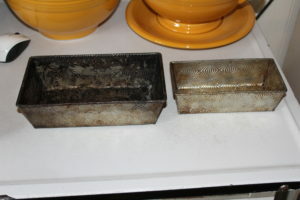 Grandma O’s two Ovenex bread pans.